George Osborne has announced that Britain will emulate Canada in its actions to eradicate the budget deficit, and attempt to recreate the miracle of transforming a nine percent deficit into a surplus with three years. This will be achieved, according to Mr Osborne, by a “once in a generation” revolution in public services, instigated by the question; “what needs to be done by government and what we can afford to do”. Be in no doubt, if the Canadian experience is anything to go by, department budget cuts in the region of 20% will lead to nurses and teachers getting the sack in addition to the ‘faceless’ quangocrats that the public love to hate, but the result will be worth it. 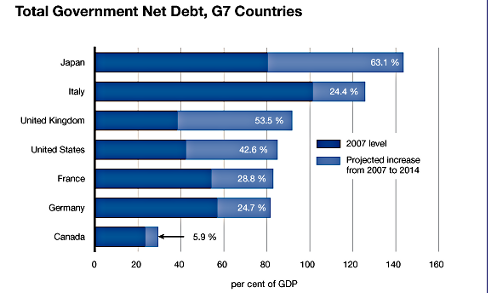 At a time when Britain was facing a future trajectory that ends with a national debt of 400% of GDP with 27% of government spending to be dedicated to paying off debt-interest in the same period, we can only look at Canada’s example with admiration as they power out of the global financial crises with a GDP growth of 5.3%.